Hi guys I have just bought myself a new 6.9 its a 1977 euro Milan brown with brown velour interior. It has been in Australia since 1977. Will upload pictures tomorrow pickup at lunch time. Last edited by m48pro69 on Wed 16 Apr, 2014 2:56 am, edited 2 times in total. Congrats! Milan Brown was a great colour in a W116 as it contrasts so well with all the chrome. Brown velour is interesting. It seems that MBs of that era had interiors that either contrasted with the exterior or matched the exterior. The Euro deliveries particularly favoured velour that matched the exterior. My Swiss delivered Thistle Green 500SLC has green velour interior, a very '70s and early '80s look. Your 6.9 being a Euro spec will also perform better than the local deliveries with their ADR27a compliance. Looking forward to seeing pics. Enjoy! So a UK import ? It looks to have the hi-comp motor. No it was sold in Germany in 1977 and then came to Australia in the same year. I am the 3rd owner gentleman i bought it from has had the car since 1995 . Car had 303000km on it then he only put 18000km on it in that time. It has had regular servicing in the time he owned it. Car is Milan brown with Brown velour still has becker mexico and emergency rubber blocks. Spare tire is still Michelin xwx so i dont think i will use it. Although Milan Brown is not my favourite colour, yours does look very sharp! A lot of people bag the Milan Brown, and it does have to be said, that when they do not present with good paint, they do look very very - well.... they look terrible. But a car that presents with good paint, good chrome always looks very very nice. It's just one of 'those colours' which has a capacity to polarize opinion. It's also one of the colours that suffered from intense fading and separation of the clear coat, which results in the milky haze forming on every exposed part of the metallic paint. I really like the colour, and with that chocolate velour interior, I'm sure it will look really sharp once you've detailed it. I think that's an impressive car for the money. The fact that it's original really helps also. 1977 is smack bang in the middle of Mercedes' 'colourful' era, when their cars had some of the most impressive colour combinations out there. Brown on brown might not be everyone's cup of tea, but I can guarantee that when you park it up at a concours, it WILL get a lot of looks, because that chrome will just bring people to admire it. Nice work on the purchase! Hi guys today i fitted the number plates that were last on my supercharged one tonner. So my 6.9 has a lot to live up to . Congrats. on the find, looks like an original gem ! I love Milan Brown in good nick..and brown seems popular again now on new Audis etc. "what's new is really old" .... think of all those '70's colours on Porsche 911's: brown, orange, green.. Picked up my 16 x 8 penta's today thank you Giles pleasure doing business with you . No problem Geoff, I hope the bonus bits come in handy. Giles wrote: No problem Geoff, I hope the bonus bits come in handy. P.S. I just remembered whT I did with the boot handle. Ok the first results are in. 230.1 HP at rear wheels for a standard 77 Euro 6.9 . flywheel corrected power is 288.9 HP so my car is very healthy as factory specs are 286 HP at flywheel . Car had Penrite HPR 10 oil full synthetic 10-50 put in last week . New NGK iridium plugs and New air filter. 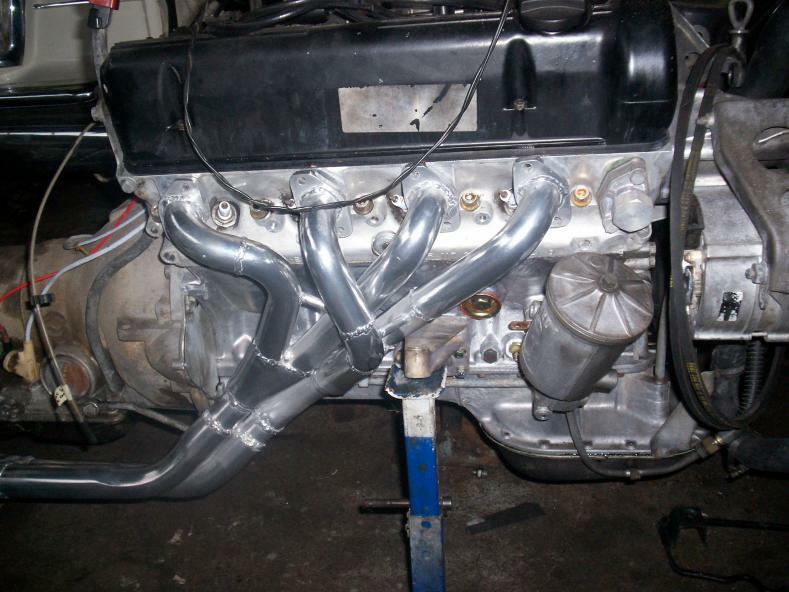 On Monday car goes to Genie for Extractors Duel 2.5 inch exhaust with x pipe and 92mm throttle body to be fitted. Then back for re run on dyno . Nice performance curve. Out of interest, how much was this test? Also, do you know how they translate the data from the rear wheels into data at the flywheel. You need to know how much power is lost in the transmission, which I would think could only be estimated. Do they have some enormous chart that tells them the fraction of power lost for all kinds of trannies? Hi David I didn't pay I have had Genie Exhaust agree to make extractors and exhaust . Dyno on standard 77 Euro 6.9 was this morning. Car goes to Genie on Monday they will have about a week . They have agreed to fit lower plenum with 92mm throttle body it has been machined out and adaptor made. It will be hot tanked before fitting. Car will go back to same dyno for re test. As for working out Flywheel power that is something I don't know about other than operator puts in car details . But this Dyno is used in almost all workshops in Australia . Also the dyno they use at Summernats. But seeing as I am from Canberra and intend to move back there in the future you will be able to see car . But seeing as I am from Canberra and intend to move back there in the future you will be able to see car . I look forward to being overtaken by you in the future. If you see a 280SE 4.5 I just ask that you slow down a bit as you pass so I can get a good look. At the risk of exposing my complete ignorance, what are the rubber "rocks" in the photo above. They don't look like engine mounts to me - are they some other mount or part of the suspension? Car has been dropped of at Genie next update will be in a week's time when I puck it up and get it dynoed. I will be taking pictures off work during the week. Ok that I was not aware off . I just watch ridicules prices they reach on eBay . And my car was the first time I have ever looked at one for sale and they were still present. And having looked at around 20 over the years and this is my 3rd 6.9 that makes them not common. Extractor flanges cut and mounted on motor. Pipe work starts tomorrow . Are you doing 4 into 1 pipes on each side or tri-Ys (4 into 2 into 1) on each side? If doing tri-Ys, be sure to get the pairings correct for each side. The cross-plane crankshaft and resulting firing order on MB V8 engines (well, M116 and M117 at least and I assume M100 has the same firing order) mean that the best pairings are cylinders 1 & 3 and cylinders 2 & 4 on the right bank and cylinders 5 & 6 and cylinders 7 & 8 on the left bank. From memory, I think it was the extractors on your previous 6.9 that had the right bank with less than ideal pairing. The photo below shows the right hand side of the M117 used in the 5 litre SLC. The 1-3 and 2-4 pairings of the tri-Y manifolds can be seen. On the left hand side it is simply 5-6 sharing one manifold and 7-8 sharing the other. These pairings are the best you can achieve on a V8 with a cross plane crankshaft without having pipes cross sides in Ford GT40 style. Only the firing order that comes with a flat plane crankshaft will allow for anything better without a complex crossover extractor setup. Hi Greg thanks for the tip I am going to see Genie in the morning . Hi Greg by right bank are you taking that from drivers seat or front of car . Ps just gave Tony from Genie copy of your picture. Yes, by "right bank" I mean on the right side looking from driver's seat. It is the bank on the driver's side of a RHD car. It has cylinders 1 to 4 and the left bank has cylinders 5 to 8. Note that different manufacturers use different cylinder numbering configurations and there are also different firing orders possible for V8 engines, even among those with the common cross-plane crankshaft configuration used on most production V8 engines including MB. I have checked the firing order for the M100 and it is 1-5-4-8-6-3-7-2 the same as for the M116 and M117. The best header configuration assuming a tri-Y configuration of 4 into 2 into 1 for each bank is therefore as per my previous post and the M117.960 engine photo. On the right bank the primary pipes from the 1st and 3rd cylinders need to share a secondary pipe and the the 2nd and 4th cylinders need to share a secondary pipe. On the left bank the 1st and 2nd cylinders need to share a secondary pipe and the 3rd and 4th cylinders need to share a secondary pipe. The four secondaries then merge into the twin exhausts under the floor in the usual fashion. Typically there will be a balance pipe or "X-pipe" between the pipes under the floor. This photo shows the four secondaries emerging from under the engine bay of my 500SLC and how they merge into the twin system ahead of the front muffler. Rather than an "X-pipe", the 500SLC uses a balance pipe across all four secondaries. The "X-pipe" tends to be more popular today. Tony from Genie said thanks for the picture . And x pipe is being fitted with duel 2.5 inch exhaust . At http://www.peachparts.com/shopforum/att ... ay-010.jpg you can see right side of an M117 with the same tri-Y configuration only in tubular headers/extractors. I can't find any images showing tri-Y or headers fitted to the left side, maybe because that side isn't as interesting with adjacent cylinders sharing. 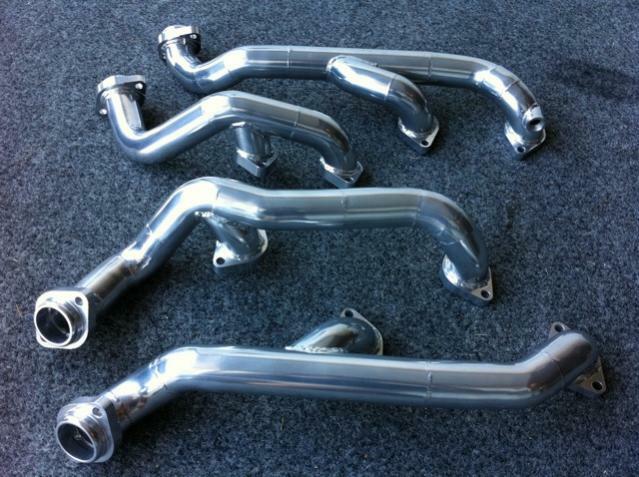 I did find the photo at http://www.peachparts.com/shopforum/att ... g_0141.jpg which shows replicas of the AMG tubular headers for both sides of the M117 used on the 500SEC. With short primaries these are very similar to the cast iron tri-Ys. Just the same, the photo shows how the cylinders are paired. Thanks Greg just sent drivers side picture . Hi Greg in case you have not seen a M100 crank and piston conrod . Here is the crank from one I killed years ago going to have it powder coated to use for a letter box. Crank angle is 90 degrees to each journal. m48pro69 wrote: ... Crank angle is 90 degrees to each journal. Hence the term "cross plane crankshaft". Some V8 engines use a "flat plane crankshaft" where every crank pin is in a single plane. These are generally only used in high performance and racing applications and have a distinctly different exhaust note to a cross plane V8 as they are essentially two inline 4 cylinder engines sharing a single crankshaft. Examples are Ferrari V8s and the V8 used in the Erebus Mercedes V8 supercar. 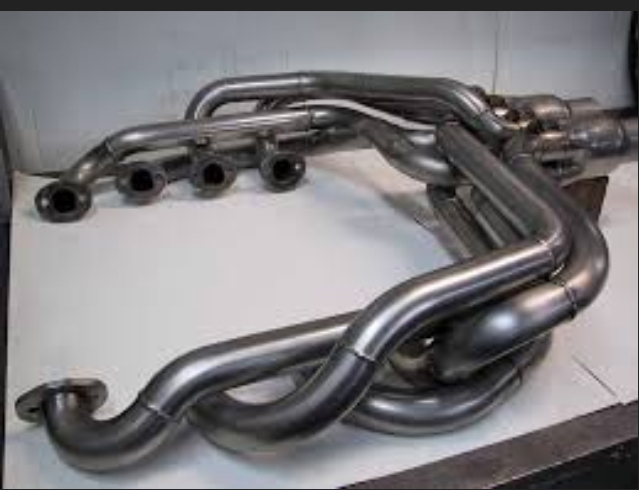 One advantage of a flat plane crank V8 is that a simple 4 into 1 or a 4 into 2 into 1 exhaust header/extractor arrangement on each cylinder bank will result in evenly spaced exhaust pulses and optimimum scavenging as the firing order alternates between banks. With the cross plane V8, for each separate cylinder bank the exhaust pulses are not evenly spaced resulting in less than ideal scavenging and the familiar V8 exhaust note. Most exhaust configurations for the cross plane V8 are therefore only a compromise with the arrangement in my earlier posts being the best possible without resorting to the crossover arrangement used on the Ford GT40 (do a Google image search for "GT40 exhaust" to see what a work of art they were). Ok 560 Air Cleaner arrived today thanks Michel. Went over to Genie Started on pipes going to be balanced . From Greg ( The cross-plane crankshaft and resulting firing order on MB V8 engines (well, M116 and M117 at least and I assume M100 has the same firing order) mean that the best pairings are cylinders 1 & 3 and cylinders 2 & 4 on the right bank and cylinders 5 & 6 and cylinders 7 & 8 on the left bank) Thanks. So we are doing this as it is optimal to making power last set were compromised. To fit drivers side some metal has been removed from the drivers side engine mount. Looking forward to seeing it all when it's completed and am interested in the gains on the dyno. Obviously a lot more work would be needed but it would be interesting to see how much power is gained from each individual mod separately (ie. air filter, throttle body, extractors & exhaust). I'm sure the greatest power limiting areas on the 500SLC are throttle body and exhaust rearward of the engine pipes. It's low to mid range torque is strong however beyond around 5000rpm it feels restricted. Its exhaust system rearward of the engine pipes is shared with every other 107 model including the 280. Only the tri-Y manifolds and engine pipes were unique to the 500SLC (and LHD 500SL). Very nice Geoff. Is there an optimal exhaust size for the M100?, when I researched the M117 most agreed on a twin 2 1/4 set up, although StreekyG's twin 2 1/2 sounds awesome. Ok not much to show yet but drivers side pipes are done with cylinders 1&3 , 2&4 paired down pipes to be added then to start on passenger side. After completion extractors are going to be ceramic coated.